Finnish K Group wants to install a network of EV charging stations at its convenience stores across Finland. Labelled K Charge, 70 stations are to form a network of 400 charge points being installed throughout 2019 in support of the nation’s EV effort. Retailer K Group that is part of Kesko says this network will make them one of Finland’s larger EV charging providers and increase the nation’s fast-charging network by 50 percent. The company supports the Finnish Government’s target to increase the number of electric cars to 250,000 by 2030 and to build 2,000 public charging points by 2020. By the end of 2019, K Group’s charging network alone will constitute a fifth of this target, according to the press release. Of the 400 charge points in the K Charge network, about 300 will feature 22 kW with another 100 faster chargers at 50 kW. The stations will be added to K Store, the provider’s chain of convenience stores, namely K-Citymarket, K-Supermarket and K-Rauta. They can be found across Finland. Therefore, K Group will also initiate projects for new mobility services starting with a car sharing trial launching simultaneously in Helsinki, Espoo, Turku, Tampere, Oulu, Jyväskylä and Lahti. They found a partner in 24Rent but the cars will not be electric for now. K Group also uses and more so produces solar power in Finland and wants to power as many of the charging points as possible with solar panels on K-stores’ roofs. 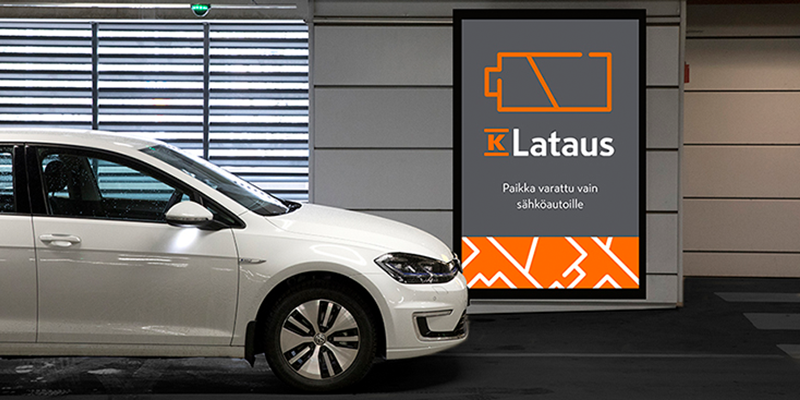 All charging points are initially free-of-charge for customers and are built in cooperation with Onninen, which is part of K Group, and Plugit Finland Oy.